Shortly after midnight on June 14, 1947, a U.S. Air Force B-29A bomber, (44-62228), crashed into the southeast side of Hawks Mountain and exploded. All twelve men aboard were killed, and to this day the incident remains the worst aviation accident to ever occur in Vermont. The flight had originated the previous morning when the plane took off from Davis-Monthan Air Force Base in Tucson, Arizona, for a navigational training mission to the east coast. The plane was scheduled to land at Andrews Field (Later known as Andrews Air Force Base) in Washington, D.C., but due to bad weather was diverted to Pittsburg Airport where it arrived at 3:07 p.m. After refueling, the aircraft proceeded towards Hanscom Air Force Base in Bedford, Massachusetts, where it was to remain overnight before flying back to Arizona the following day. However, the weather grew worse, and with poor visibility and darkness falling the crew became lost, ending up over Vermont instead of Massachusetts. 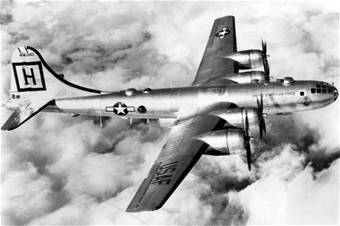 Just before midnight the B-29’s radio operator tried making contact with Boston, but was unsuccessful. The transmissions were picked up by Corporal Wendell J. Adams monitoring the radio at Grenier Field in Manchester, who contacted the aircraft to ask if he could be of assistance, to which he was told that he could not. Not long afterwards citizens of Perkinsville reported hearing the B-29 circle low over the town just before the engines abruptly stopped and a huge fireball erupted on Hawks Mountain. The time was set at 12:14 a.m. The B-29 was part of the 64th Bomb Squadron assigned to the 43rd Bomb Group. Staff Sgt. John J. O’Toole, age 23.